Author: Marjolijn Aalders Grool. Series edited by: Wilhelm J.G. Möhlig. 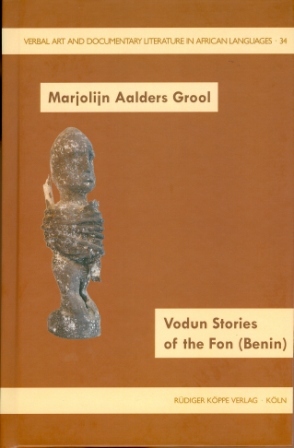 The present book contains a corpus of 37 Fongbe hwènùxó stories that were recorded by the author in 1976 in three villages in the south of Benin. The book presents the original Fongbe version as well as their English translations. The analyses of the performance of the stories have been published as volume 32 of the series Verbal Art and Documentary Literature in African Languages by the same author, Verbal Art of the Fon (Benin), (see link at the bottom). Hwènùxó translates as words of the past, and indeed the stories of this genre are narratives of events in the past; they are stories of Fon heritage that have an educational element, i.e. they aim at the education of children and give advice for life. The stories in this book are preceded by an introductory part that gives the historical and ethnographic background of the stories as well as their religious meaning. Furthermore, it discusses the way the performers structure the narrative discourse of hwènùxó as well as the language usage, the underlying meaning and the elements that are used in creating the story. Moreover, the introduction elaborates on the procedure of collecting the corpus, the context of the performances and the process of transcription and translation. Following a bibliography and a listing of the performers and performances, the actual stories and their English translations are presented in the chronological order of their recording in the three sites. A matter of life and death (Abomey-Calavi 19). How Yoh was up to his tricks again, or so he thought (Abomey 10). Summing up, it is pertinent to say that both publications [Verbal Art of the Fon and Vodun Stories of the Fon], so long awaited, deserve the attention of all those who are interested in the verbal art. Not only in Benin and Africa, but all over the world.